Dr. Kim is amazing, I don’t think I’ve ever had a dentist be so gentle when administering novacaine and putting inmy first crown (which I was terrified of). I am not a fan of going to the dentist but would highly recommend her. She explains everything she’s doing, is quick and thorough. Dr. Kim is amazing, I don’t think I’ve ever had a dentist be so gentle when administering novacaine and putting in my first crown (which I was terrified of). I amnot a fan of going to the dentist but would highly recommend her. She explains everything she’s doing, is quick and thorough. Doctor was pretty friendly and professional. She took time to explain and answer questions. Office was neat and staff werecourteous. I did fill in all medical records prior to appointment via Zocdoc which were not updated when i reached. So had to give those again . But it didn’t take long. I would highly recommend the doctor. Doctor was pretty friendly and professional. She took time to explain and answer questions. Office was neat and staff were courteous. I did fill in all medical records prior to appointmentvia Zocdoc which were not updated when i reached. So had to give those again . But it didn’t take long. I would highly recommend the doctor. 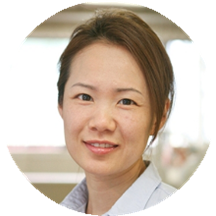 Dr. Najung Kim enjoys working with patients of all ages and has a lot of experience working with the little kids. Dr. Kim is known to be an approachable person who loves what she does and always does everything with a smile. Dr. Kim is very excited to meet you at our Glenview and Hanover Park offices, and as always if you have any questions she will surely answer them with a smile. When Dr. Kim isn't in her office she enjoys eating out, catching a movie and bowling with her family and friends. Maybe you'll see her out and about eating at her favorite restaurant or even playing a few games of bowling. The two sisters come from a long family line of dentists. They have aunts, uncles, cousins, and not to mention their youngest brother who graduated May of 2009 from UIC dental school and another sister who is currently attending SIU School of Dental Medicine. This appointment was for my thirteen-year-old she's always great! Very neat and clean dentist office. They are really nice and work well to make sure you are comfortable and well taken care of. I went to Glenbrook Family Dentist based upon reviews I've read. I have had the privilege of having 2 of the 3 sister dentists attend me. Gosh, they are wonderful.... Two words; Professional and Efficient. I actually look forward to going. I have awful teeth but Kim is helping me fix my many years of damage. Stay away from soda kids! Really good doctor and she’s really nice too. Prompt, gentle, and courteous manner of welcoming me and a kind introduction. Pleasant atmosphere to walk into. No problems at visits. Dr. Kim told me what to watch for and execute motions for dental health. My visit was very pleasant she treat me like a king she is very humble and highly intelligent. My Korean DDS is the greatest. I have been at this location several times over the years and I appreciate the service and professionalism given to me every time.I highly recommend the staff there with Dr,Kim. I was extremely satisfied during my last visit. The desk secretary/receptionist directed me to an open room and started the cleaning process. Dr. Najung Kim reviewed, checked and finalize the process with no wasted time. I was out in approximately 45 minutes. She was very caring and considerate, and told me exactly what work I needed. I really appreciated that she will submit what she would like to do to my insurance company before performing any work. This was never an option at my previous dentist! always pleased with the dental care provided . My two young daughters and I have been seeing Dr. Kim and her sister for two years now. We are seen right away, typically only 5min wait or right after we check in! She is very attentive, listens to your concerns,gentle, and explains the procedure step by step in plain English! I would definitely recommend Dr. Kim to my family and friends. Her staff is also knowledgeable and very nice. I love going there everyone is so nice and i always get in right away. I literally just walked right in no wait at all. I took my 4 month old with me and she started crying as the dr wasdoing work on my teeth and the other doctor came in to help with the baby. Baby stopped crying and i got to finish my appointment with out worrying about her. That was really nice of her! Had a crown come off. Was treated very quickly. And I'm highly pleased with my results. Walked in and didn't have to wait. My dental exam was thorough, but fast. Teeth look much better after cleaning. Will most likely come back in the future. Excellent service! No wait time! Friendly and very informative! It really felt like they just wanted to sell my husband more than he needed. These ladies are the greatest. Excellent in every way. She is the best and very kind. The sisters at Greenbrook Dental are the best. They are always courteous and empathetic. Nothing could have gone better. Total efficiency and professionalism. I really appreciated the tutorial on how I SHOULD HAVE BEEN BRUSHING MY TEETH TO HAVE PREVENTED DAMAGE. Extremely friendly dentist and staff! Her staff was very friendly and helpful and Dr Kim was very gentle and explained everything thoroughly. I'm really happy and will recommend family and friends. I appreciate her professionalism and her personal concern with my dental care. Very professional, pain free tooth extraction and educates you well. She is very patient and did a really great job fixing mg child's teeth. Would really recommend! Love Dr. Kim! She's the best dentist I've had! Highly recommend her for kids and adults!! Excellent service I was seen right away! She's great, no pain during the cleaning process. Educates you well, very professional and friendly. Dr. Kim was courteous, professional and gentle.